What is on offer here is a choice between a 170 bhp turbo diesel engine or a 122 bhp turbo petrol engine. I tested the 1.8-petrol version in Sport specification which I suggest will prove popular for those undertaking mixed types of journeys such as some short trips and also longer journeys. This car turned eyes and generated lots of questions, invariably from existing Mercedes-Benz owners and from those currently driving other premium brand cars. Hey! I thought, this car is selling itself! 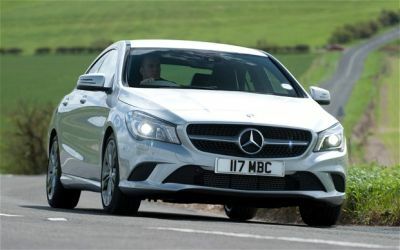 Mercedes-Benz has majored on rear wheel drive cars and this sensibly sized, very comfortable five-seat saloon sticks to that layout, offering very competent handling, bags of driver feel good factor, a slightly firm but not uncomfortable ride through the slightly lower Sports/Comfort specification suspension and invigorating performance from the modern age 4-cylinder engine. Mechanical noise is not bad, just a slight beat when the engine is working up and some rumble from the good gripping tyres. As I have come to expect, the output of modern car engines has come in leaps and bounds and from this 1.6-litre engine, that incorporates variable valve timing and stop+start system, the performance is seriously impressive. Top speed is a claimed 130 mph with acceleration from rest to 62 mph (100 kph) said to take a respectable 9.2 seconds, the performance being aided by a sensibly ratioed 6-speed gearbox that provided accurate and quick changes though I suspect on the very new test car the mechanism would get even snappier once it had loosened up. The efficiency of the power unit is also proven by an official combined fuel consumption of 50.4 mpg which I suggest equates to a real world figure of around 45 mpg unless one really presses on a lot. The interior is as impressive as the exterior, finely sculpted plastic mouldings, bold instrumentation that sensibly included a digital KPH reading as well as the usual MPH, clearly marked minor controls and sensible use of chrome and patterned metal trim. Looks the business, typical Mercedes. The high back leather upholstered front seats feature incorporated head rests and provide figure hugging comfort and the memory electrically adjustable facility, excellent pedal positioning and adjustable steering column enable the driver to tailor a comfortable driving position regardless of physical individuality. Both front seats are adjustably heated. Driver vision is very good from the front and to compensate for the high boot line there is a rear view camera (a cost extra item) plus standard fit automatic parking system. State-of-the-art directional headlights and powerful rain sensing wiper system make for easy driving under all conditions. Styling might suggest practicality sacrifices. Well, nothing serious, rear passenger space is actually more than acceptable for three adults both for head and leg space, the boot has small aperture and a high lower lip but though shallow goes back a long way and the space can be augmented by the 60/40 split folding rear seats. There are chrome luggage securing lugs in the load space but no evidence of a spare wheel. Safety is up to the usual high standard I expect from this car brand. Air bag protection is extensive including the usual front bags plus head and side airbags and a driver’s knee airbag. There is a collision prevention assist system, adaptive brake lights, an active bonnet to minimise pedestrian impact, crash responsive emergency lighting, Acceleration Skid Control system, tyre pressure warning system and a fatigue alert system. For general kit this car is right up there, the package comes with an easy use satellite navigation system, keyless start/stop, an extensive infotainment system, automatic climate control, multi-function steering wheel, on-board computer and a lot more. That’s just for starters and there are some desirable options as fitted to the test car, these included auto fold exterior mirrors, lane tracking package, blind spot assist, run flat tyres – still a very competitive price for a very impressive car. It is on my short list! MAIN RIVALS: BMW 3-Series, Audi A4, Mazda6, Honda Accord, Alfa Romeo Guilietta. There are also warnings that users should never leave the car unoccupied at motorway/auto route service stations.